Friendship—what a beautiful theme. I just have to repost this photo. Please forgive me as I used this for the Summer Challenge, too. I will leave the post as written because I think it speaks so strongly of friendship. But I think for many it is only the beginning of a vast array this week. I repost because I need the strong reminder of the quote. Remember, everything I write I’m writing first to myself. 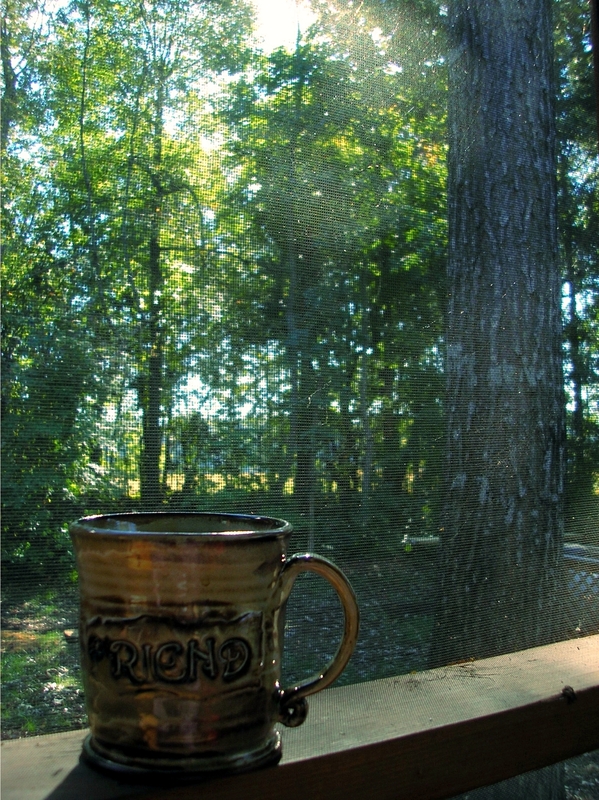 This photo was taken at the dawn of summer when I clean and open the back porch and enjoy morning coffee in the early morning hours—sometimes with my husband, sometimes with friends, sometimes alone. Summer is here when I can do this every day. I love the way the sun filters through the screen—even more refreshing after an early morning rain. When I saw the Summer theme, I have an endless supply of summer photos, as I’m sure all do. My wonderful flowers voice summer but they do so loudly. I wanted something a bit different that portrayed what signals to me summer’s true arrival. And for me it’s about family and friends. Summer brings them out in abundance with a carefree, relaxed attitude. They let down and give their most precious possession—TIME. And in return I give—TIME. My friends and family love each other through joys, sorrow, and quirks. Sharing morning coffee strengthens us to keep trying, growing, and we just enjoy the company and laughter of each other. If you have taken the time to read this, then I consider you a friend dropping by as well. I’m enjoying this exact place this very moment and am honored you joined me. I hope you enjoy this strong reminder. Remember, your friends come with wrinkles. But so do you. So do I. We try to straighten each other out, don’t we? But we forgive and take each as we are, wrinkles and all. Who wants the alternative—to be alone? I think this voices what I’d like to say to all of you. Thank you for stopping by … friend … and taking the time to comment.